Created to replicate rural New England life in the 1830s, Old Sturbridge Village is the largest outdoor living history museum in the Northeast, covering over 200 acres and encompassing 40+ antique buildings. Several of the buildings were moved to the current property over the past 50 years. Dozens of interpreters share stories of what daily life was like during the 1830s and offer visitors plenty of hands on experiences and demonstrations. With each season comes special events and workshops for all ages, so it’s worth visiting Old Sturbridge Village at least once a season. Wear sneakers. The dirt paths, while well defined, can get muddy or uneven based on the weather. (And watch out for the occasional horse manure). Bring the stroller for the toddler set. The village is spread out, which is great because it doesn’t feel crowded (even if it’s a busy day) but little feet might get tired out when you’re far out in the village. Many of the buildings are handicap and stroller accessible, although try and leave the stroller outside of the buildings as many of them are tight quarters. Restrooms are located in the main Visitor Center and a few areas throughout the village. Check the map for locations. There are several spots for dining and snacks in the Village: the Bullard Tavern offers a variety of lunch options, the Grant Store and Bake Shop offers homemade sweets and hot and cold drinks, and the Museum Gift Shop Cafe offers snacks and drinks. The Oliver Wright Tavern is located right outside the entrance to the Village and is open for Sunday brunch. A gift shop and bookstore, located near the Visitor Center, sells lots of souvenirs, apparel and housewares. Check online here for daily hours (hours vary by the season; the Village is only open on weekends in January and February and is usually closed on Mondays and Tuesdays) and special programming like the Dinner in a Country Village and Stay Overnight with the Bixbys. Admission tickets allow visitors to leave and return same day; just save your receipt. Season passes are available at a great rate if you plan on visiting each season (and you should!) and other offers and promotions can be found here. If you can’t get enough of traveling back in time, stay overnight at the adjacent Old Sturbridge Inn and Reeder Family Lodges. Find our more here. 1. Kidstory- Start in the Visitor Center with this hands on exhibit for younger children, Kids can match animal noises, act as a store proprietor, and piece together quilting blocks. 2. Chop wood in the fire pit. 3. Pet a variety of animals in the outdoor barns, including horses, pigs, and sheep. Watch out for the roaming roosters and chickens! 4. Catch a ride on the Carryall, a horse drawn carriage, which will bring visitors around the village, with historical narration by interpreters. 6. Learn about weaving and knitting inside the John Fenno House, the oldest building in the village. 7. “Deposit” money in the Thompson Bank and learn about how foreign currency was used during the 1830s and 1840s as the United States didn’t have a lot of gold and silver. Check out the small vault, used to protect records of borrowers, and ask to read the counterfeit detector. 8. Help set the printing press and learn about the origination of capital (uppercase) and common (lowercase) letters as well as font styles and sizes in the Printing Office. 9. See the evolution and style of eyeglasses and read about 35 centuries of glass making in the Glass Exhibit. 10. Play in the outdoor A Child’s World playground and compare popular mid nineteenth century toys with modern versions. 11. 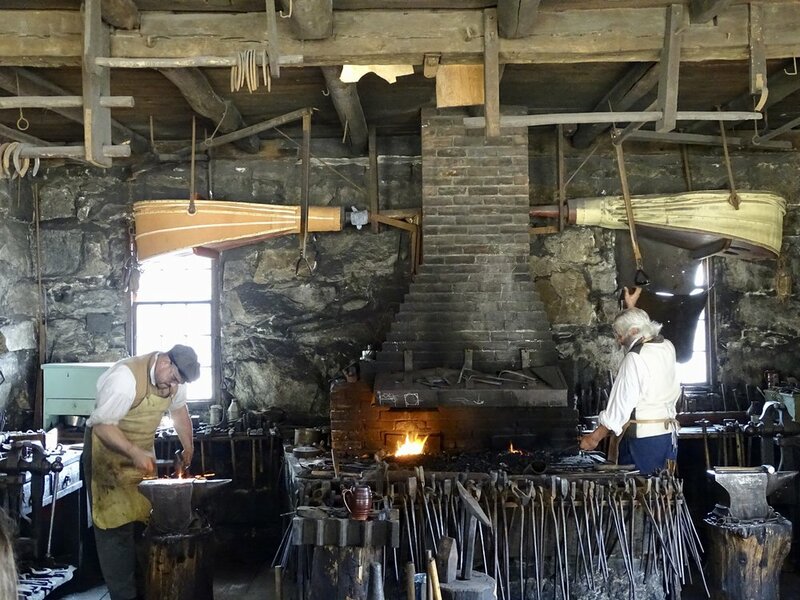 Hear the blacksmith hammer and shape metal in the Blacksmith Shop. Watch carefully as they use the forge to push the air from bellows into the hearth to keep the fire burning. 12. Watch a cobblestone tend to broken shoes in the Shoe Shop. 13. Explore the seven rooms filled with personal artifacts of the Salem Towne House (originally built in 1776 in Massachusetts). Most rooms are open and decorated with period furniture and personal items. 14. Follow one of the three walking paths: Woodland Walk, Pasture Walk, and River Walk. Find maps and information here. 15. Walk through the Vermont Covered Bridge. 16. Watch out for buzzing bees in the Beehive Beekeeping Hut. The queen bee can lay up to 2,000 eggs a day. 17. and 18. Rest wary feet by pretending to be a student in the District School or the Meetinghouse used for Sunday worship. 19. Pick a favorite period piece of pottery in the Pottery Shop. There are hundreds of mugs, cups, knobs, and plates available for purchase in the gift shop and visitors can see the pottery in various stages of completion in the Pottery Shop. 20. Listen to the contrasting tones of different clocks striking every hour in the Clock Gallery which features hundreds of clocks dating back to the 1780s. Many of the clocks were collected and donated by J. Cheney Wells, one of the founders of Old Sturbridge Village. Spring: Maple Days offer a chance to learn about the entire sugar making process- including tastings!- and Family Farm Fest celebrates the arrival of spring and the beginning of the plating fields and seasonal chores that include visitor participation. Summer: Wool Days usually occur on Memorial Day weekend and include sheep shearing demonstrations and wool spinning. July 4th celebration is the idyllic spot to celebrate America’s birthday with parades, barbecues and picnics, and a chance to sign a replica Declaration of Independence. The Redcoats & Rebels weekend includes reenactments with over 1,000 soldiers and opportunities to visit military camps and participate in musket drills, cannon demonstrations, and training camps. Fall: Apple and Agricultural Days are filled with harvesting tons of fruits and vegetables, plowing the fields, and cooking and preserving apple cider in the ox powered cider mill. Winter: Christmas by Candlelight includes the North Pole Village (Santa’s Workshop, candle dipping, G-scale model trains), special readings of holiday classics, and Victorian carolers performing throughout the village. Want to follow along on our adventures? “Like” us on Facebook and follow along on Twitter and Instagram. Disclosure: My family was given a media pass to visit Old Sturbridge Village. All opinions expressed are my own.